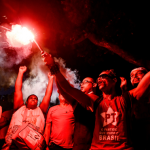 Brazilian union leader Joao Felicio, now President of the International Trade Union Confederation (ITUC), is flying into London this week to stir up opposition to the counter-revolution underway in Brazil. 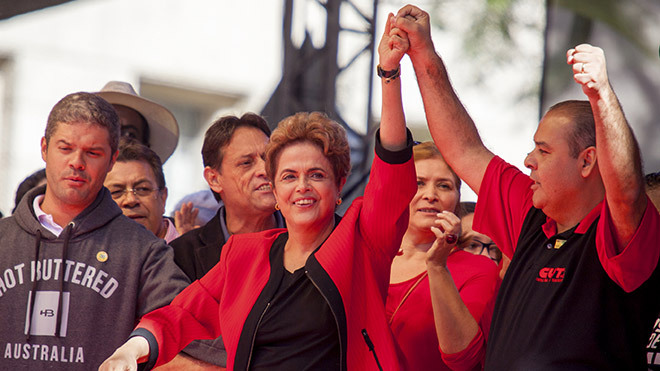 The Parliamentary chaos that ushered in the suspension of democratically-elected President Dilma Rousseff is as nothing to the chaos that would greet her impeachment. Already, 7 Latin American states have refused to recognise the government of her replacement, treacherous Vice President Temer. And already, the counter-revolution has begun, with the scrapping of the Ministry of Human Rights. 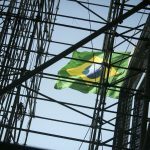 Last Tuesday, TUC General Council international spokesperson Sally Hunt handed in a letter of protest from the TUC to the Brazilian Embassy. On Tuesday night Joao Felicio will be meeting Workers’ Party members in London, and on Wednesday he will meet with Sally and TUC General Secretary Frances O’Grady, as well as union international officers before heading for Brussels. Next Monday evening (23 May), British trade unionists will gather at Unite’s London head office to protest at what Portuguese speakers call “golpista” and we generally call a coup. 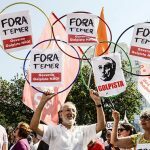 So far, Bolivia, Chile, Ecuador, El Salvador, Nicaragua, Uruguay and Venezuela have refused to recognise the Temer government, and the CUT (use the translation function) are backing the Brazilian Workers’ Party (scroll down) in denouncing the coup. The impeachment of the President for the alleged crime of putting a positive spin on the nation’s finances ahead of her re-election in 2014 – a ‘crime’ that would see most democratically elected governments ejected – is being prosecuted by corrupt Brazilian legislators – surely the sort of people that David Cameron’s anti-corruption summit last week was aimed at?